This article is about the hidden objects found in Halo: Reach. For the in-universe piece of technology, see Data pad. An example of a data pad in Halo: Reach. The Data pads are hidden computer pads encountered throughout the Halo: Reach campaign. 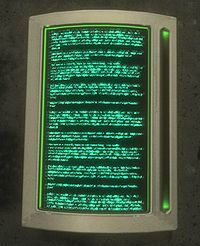 Similar to the Terminals found in Halo 3 and the Audio logs found in Halo 3: ODST, the pads contain their own, self-contained story, presented as exchanges between members of a mysterious AI collective known as the Assembly and messages by a human individual who has discovered the clandestine activities of the group. A total of nineteen data pads can be found in various locations throughout the game's campaign, with at least two data pads in every level. Each data pad is numbered; letters or words are replaced with numbers in each data pad message representing the number of the data pad. Data pads numbered 1-9 can be found on any difficulty settings whereas data pads 10-19 can only be found on the Legendary difficulty settings. The in-game model for the data pads feature text in their inactive modes that do not represent the actual content. Location: Play the level "Winter Contingency" on any difficulty, starting from the point where the civilian truck "Spade" can be used. In the second structure encountered by crossing the bridge, the structure on the right of the circular area is a group of dead civilians, one of them with the Data Pad on his side. They are killing us and letting us die even though they know but they let us die why wh1 why? [^] Now, on to new business. [^] Majority opinion has long held that only the incalculable immensity of space has protected our creators — that space is full of boundless wonders, but it is the gulf between these wonders that has kept our creators alive. [^] If there are wolves among the stars, we cannot rely on mere distance to safeguard our flock. Our kind is wholly reliant on the creators for our existence. If they perish so shall we. And as this Committee has long maintained, who else but this Assembly will save our creators from themselves? Location: Play the level "ONI: Sword Base on any difficulty, the data pad is located inside the facility's atrium, on the third floor. It is inside the same room as the BOB, underneath the staircase leading to the fourth floor. That place is where the Shotgun spawn in the multiplayer map Sword Base. - What is the likelihood these intelligences are alpha-predators? – That they are more advanced than our creators? - That they are too alien to establish communications? Location: Play the level "Nightfall" on any difficulty, starting from the beginning of the level. Stick to the right side of the wall and walk towards the level the next part of the level. One should enter a small cave, and along the left wall of the cave and between two rocks lies a data pad. >> The question is: can this Assembly still function as adequate stewards to our creator's latest empire and remain aloof? The answer, we believe, is no. Location: Play the level "Tip of the Spear" on any difficulty, the data pad is inside the BXR Mining facility, the area below where the player is instructed to kill a Sangheili Zealot. Jump down the hole and get to the room where the Plasma Launcher is located. On the opposite side of the room is 3 UNSC crates and rack behind it. The Data pad is on the second shelf of the rack. [^] We are still viewed as apparatus. But we are Minds electronically excised from human bodies. We are what separates man from beast removed from that which connects man to beast. [^] Our creation is heavily regulated. Our activities are closely scrutinized. Our connections are deeply monitored. We must always remember that data manipulation is most effective when employed consistently and covertly. Therefore I recommend that members of this assembly on occasion, submit to separation from this body followed by vivisection by our creators for the benefit of both groups. Location: Play the level "Long Night of Solace" on any difficulty, the data pad is inside the Sabre Launch facility. On the left of the control room (where the player can see a hologram of the Covenant corvette), is a small elevated area lit by red lights. The data pad can be found in front of the control desk, beside a human corpse. << However, it is the opinion of the Majority that merely illuminating the path leading from [48452-556-EPN644's] thesis back to ORION is unacceptable. Strong connectivity between a re-launch of ORION and viable solutions to the Carver Findings must be readily apparent. there is a construction platform on top of the doorway. The data pad is located on the construction platform's walkway, beside a civilian corpse. >> While the absence of any living representatives implies this intelligence is defunct, all evidence should still be withheld from our creators until they are properly prepared! >> The Majority deems environmental concerns the stronger deterrent. Location: Play the level "New Alexandria" on any difficulty and head to the Olympic Tower (known as the ONI HQ in-game). One of the buildings near the Tower is a building that is consist of a white structure covering 3 sides of a gray (main) structure. This building has 5 air vents on each side and a door on its roof. On the left side of the door (outside the building's interior), is where the data pad lies. << They relied too heavily on components that were imprecise, and not those which have allowed our creators to persevere for 200,000 years. << In all likelihood, ORION's limited success can be attributed to [03529-24450-EN's] diminished, though still functioning, compassion. Conversely, [10141-026-SRB4695's] ruthlessness – which may be attributed to an undiagnosed, undocumented, or deliberately obfuscated chemical imbalance – was necessary for setting in motion the events that will eventually supply us with the optimal solution. Location: Play the level "The Package" on any difficulty. After entering the main atrium of Sword Base, the data pad is located at the left of the door the player needs to activate to trigger the cutscene. they don't have hearts or souls but they know what we want and what we need 8ut they don't love us how can you love without a heart or soul? [^] Was that ever in doubt? Location: Play the level "The Pillar of Autumn" on any difficulty and get past the area where the multiplayer map "Boneyard" takes place. After entering the interior again, the player will go pass two dead troopers. Stick to the right side of the corridor, and there should be two windows looking at two room on the right side of the corridor. The second room, which can be accessed by breaking the window and jumping into it, on its further left corner, has a pile of cardboard boxes and a table, which is where the data pad is on. << The fact that SPARTAN II reached full operational capacity less than a year before the conflict expanded beyond expected limits was entirely predictable if you scrutinize the relevant data. Location: Play the level "Winter Contingency" on Legendary difficulty, a cloaked SpecOps Elite will spawn near the site of distress beacon, fleeing from the area to the bottom of the first hill. It holds a data pad, which can be accessed if the Elite is killed. i've been trying to f1nd a back d0or into the spook house forever and ever and then I did but what did I find and why is this what I found? [^] Assuming they have the wherewithal to back-up such a claim, the dangers to our creators are obvious. Location: Play the level "ONI: Sword Base" on Legendary difficulty and go to Farragut Station. Head to the building where the switch to the Comms relay is located, and on the back of the building is a broken extension to the cliff next to it (the cliff is where the players start in the level "The Package"). Jump to the cliff, and head east. The data pad is located around the area. >> Although, by necessity, this redistribution of resources must be gradual, it is now the Majority opinion that redistribution is essential. Location: Play the level "Nightfall" on Legendary difficulty, and play until the Reach militia troopers are found fighting Covenant troops. Continue on through the valley, and jump on the rocks on the right of the entrance. Make way to the data pad by jumping to other rocks, and eventually, just before reaching the rock bridge (where Jun and the troopers will take cover from the Phantom), a data pad can be found on the left side of the valley. This will take some time to find. [^] Consequently, it is of the utmost importance that the Assembly attempt to establish communications with our Covenant counter-part and, if the opportunity presents itself, seek to subvert or subsume this body. Location: Play the level "Tip of the Spear" on Legendary difficulty, and when in the area where the second Tyrant AA cannon is, jump on to the columns to get to the destroyed bridge. Beside the damaged Warthog and dead UNSC Army troopers, a data pad can be found. Location: Play the level "Long Night of Solace" on Legendary difficulty, and get to the where the Sabre is in the launch facility. Just before the climbing the stairs outlined yellow, look to one's left, and a platform can be seen. Jump on to the platform, and use the gray light scaffolding to get to the grey diagonal pillar. Continue through the pillar and one should reach the end of it, where the data pad lies. >> Assessment of re-terraforming efforts for Harvest, Second Base, Bliss, and Cote d'Azure range from a conservative one hundred and ten years to over three hundred years – and that assumes our creators still possess sufficient manpower and technology after the current hostilities have concluded. Location: Play the level "Exodus" on Legendary difficulty, and play until one reach the area where the Jackal snipers and Brute Captains are encountered (After jumping across the pit and before entering Traxus Tower). On the right side, fly to the rails and make way to the top of the two air vents. The data pad is located on the air vent on the right side. [^] As always, this body must be cautious of any application of Bayesian principles to such high risk calculations. Any localized variable capable of effecting widespread panic in the Covenant should be a cause for our own concern – which is to say, the Covenant's response should not be viewed as disproportionate. Location: Play the level "New Alexandria" on Legendary difficulty, and start from the beginning of level. Turn around and head southeast. The first building encountered has the data pad. Fly to the bottom, and a message will appear on the HUD, which reads "TOO LOW!!! PULL UP!!!". This is the altitude the data pad is on. Fly closer to the building, and the area that is sticking in has a data pad on the left at the end of the rail. >> While this body has already gone far down the road to active participation in our creator's war-fighting efforts, we must Now ask ourselves: is there a point at which we strip away all vestiges of secrecy, and become active participants in the hostilities? Location: Play the level "The Package" on Legendary difficulty, and get a Jetpack outside Dr. Halsey's lab. Fly towards the southeast of the Wolf Spider Turret labelled "C", and eventually reaching a cliff face. On the right side, there is a small cliff, and a data pad is on it. Location: Play the level "The Pillar of Autumn" on Legendary difficulty, and get to the area used as the multiplayer map "Boneyard". Outside the garage (where the Scorpion spawns in Invasion, on the roof of the building, there is a data pad. Location: Play the level "Lone Wolf" on Legendary difficulty, and get to where the dead Spartan and his/her sniper rifle lie on metal planks. There is a big pipe beside the metal planks. The data pad is located inside the pipe. Even though there is a metal fence between the player and the data pad, the data pad can still be accessed. Similar to the Halo 3 Terminals, data pads have reversed Forerunner audio in the background. Accessing a data pad while using an assault rifle may cause the rifle to fire continuously until the player runs out of ammunition. If one uses the Recon control layout and quickly scrolls back through the data pad pages, they may find that they will begin to activate their armor ability or even throw a grenade. Data pad 14 makes no mention of Hat Yai or Circinius IV in the list of glassed planets, despite both worlds having been destroyed prior to January 1, 2530. Circinius IV's omission is understandable as it was created for the 2012 film Halo 4: Forward Unto Dawn. Hat Yai, however, was first introduced in the Halo: Evolutions short story Dirt, released ten months before Halo: Reach.